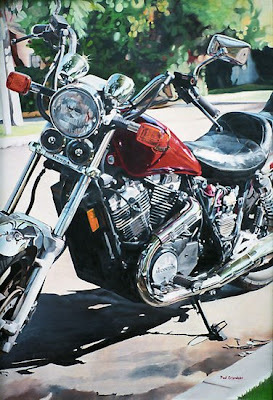 This is the painting of mine that comes closest to Photorealism. Many people have mistaken it for a photograph, in fact. I had it at an open-air Art Fair years ago, and very few people gave it a second glance. They thought it was simply a large photographic print. I'm particularly pleased with the success I had in rendering the chrome. Please go and check my RedBubble site from time to time. More works will be added soon!